"Alabama loses key players but has bulk of talent returning"
Crimson Red Sports > Around Campus > The Quad > "Alabama loses key players but has bulk of talent returning"
Finally some good news! A half-full article. 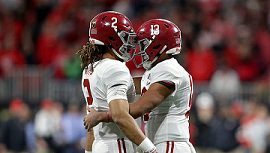 Re: "Alabama loses key players but has bulk of talent returning"
I saw a good quote the other day: “If you think your glass is half empty, pour it in a smaller glass and quit your bit**ing”. I'm down to a shot glass. In this world it is a good thought. I do however think we need to go to work and out work the other fan bases by cheering our teams on even though for instance, our BB team ain't bouncing the ball very good. I am wondering what is going on with our chances for the Big Dance this year? RTR!